A heavenly escape to many is a luxury hotel stay, but there’s growing appeal for privacy and exclusivity, staying in your own well-appointed homely enclave. The canny trick is finding ones that still incorporate the key elements of a full-service hotel. After all, we, the Airbnb generation of self-confident travellers, may love the adventure of seeking and renting beautiful homes, but unless you find one next to a Michelin restaurant, a riding school, with un-vetted access to leisure facilities and spa, a cleaner and butler on tap, or have enough money to take your own entourage, you may find your independent breakaway is anything but. What it offers: A unique and historic grade II listed house set amongst idyllic private gardens and within the Coworth Park estate. The Dower House was where Harry stayed the night before the royal wedding, as well as a favourite with everyone who visits. It offers three en-suite bedrooms with king-size and twin beds, private gated entrance and parking, two fireplaces (in the living room and entrance hall), study, dining room, 65” high definition, flat-screen television, fully-equipped kitchen with your own personal chef and butler upon request, and your own secluded gardens. What the hotel offers: Dorchester Collection’s luxury country house hotel and spa. The Mansion House offers Michelin-starred fine dining in Restaurant Coworth Park as well as a luxurious bar and lounges. There is also casual dining in The Barn at Coworth Park and in The Spatisserie in the award-winning spa facility, with gym, tennis court, equestrian facilities, polo fields, kids club and 240 acres to explore. Costs: From £5,000 per night. Luxury Restaurant Club offers available with dining, download free app here. What it offers: The glorious Garden Villa gives guests their own private residence at the Royal Crescent Hotel. It can accommodate 8 people and has two luxury suites and two deluxe bedrooms, private access to its own tranquil south facing Walled Garden, fire-pits for an atmospheric evening gathering, and is pet friendly. What the hotel offers: Set within the world famous, showstopping Georgian crescent. A five star hotel, in 1 acre of grounds in central Bath, five minute stroll to central high street Bath, award-winning Dower House restaurant, contemporary styled bar, award winning The Spa & Bath House. Costs: From £1,940 per night. Luxury Restaurant Club offers available with dining, download free app here. What it offers: Foxhill Manor is where you get your own private manor house hotel in the Cotswolds overlooking the village of Broadway. It is the perfect spot for celebrations or a break with friends, with a full service team behind the scenes where everything revolves around you. It’s an intimate Grade II listed Arts and Crafts country home refreshed and revitalised for the 21st century with all the character and charm of a boutique-hotel hideaway – but where you are the lord of your own manor. It has 8 luxurious bedrooms, including three suites, accommodating up to 16 people, comfortable lounge with great views and roaring open fire, a ballroom with space for up to 70 guests – ideal for big parties and sit-down dinners, cosy and stylish state-of-the-art screening room with games console and massive tv, 400 acres of grounds to explore, full use of the House Spa at Dormy House for a spot of celebratory pampering (the hotel will drive you up and back too), and importantly a host team (chef, house manager and staff) on hand to look after you and your guests throughout your stay. Rates are for bed and breakfast but the chef is yours so you just pay for the food if he is doing lunch or dinner for your party. 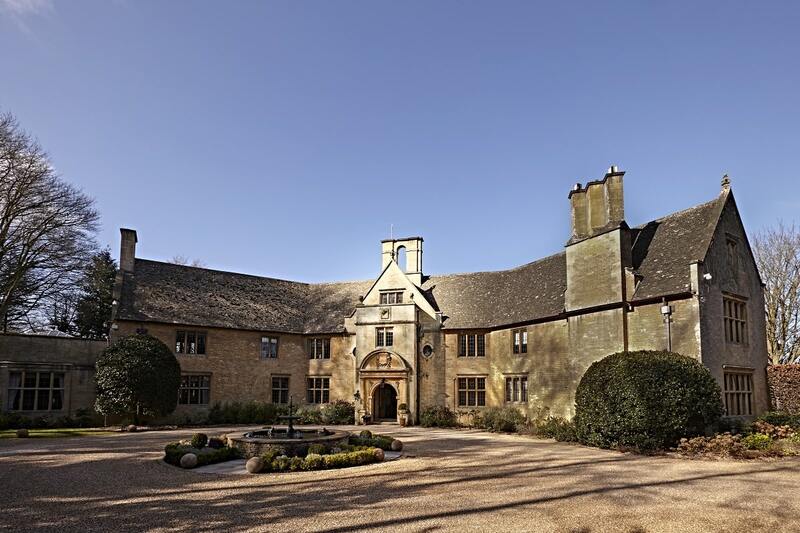 What the Estate offers: Farncombe Estate is on a large 400 acre Cotswold Estate of sprawling forests, fields, riddled with rambling trails and cycle routes, and includes two hotels to choose from: the stylish rural retreat of Dormy House and the quirky unique The Fish. Two dining options at Dormy House (fine dining in The Garden Room and laid-back style of The Potting Shed) and one at The Fish (Hook by Martin Burge for head-turning gastronomy). There is also a luxurious spa facility at Dormy House. Costs: From £4,500 per night. Luxury Restaurant Club offers available with dining, download free app here. What it offers: A beautiful stone built cottage which accommodates up to 6 guests within the grounds of one of the UK’s finest five star hotels. It has 1 double bedroom with en-suite shower room, 1 twin bedroom with en-suite shower room, 1 double/twin bedroom (zip & link) with en-suite bath and shower room, hand built country kitchen with range cooker, Dining room, 32’ living room with log burning stove, enclosed garden and terrace. What the hotel offers: Michelin starred Restaurant Hywel Jones, award-winning brasserie, stunning lounges in the main house, kids club, equestrian centre, 500 acres of parkland, award-winning spa (winner Best Hotel with Spa at the Condé Nast Johansens Annual Awards Spa Hotel 2019), Well Being House, outdoor gym as well as indoor, tennis courts, five-a-side football pitch, and cookery school. Costs: from £1,100 per night. Luxury Restaurant Club offers available with dining, download free app here. 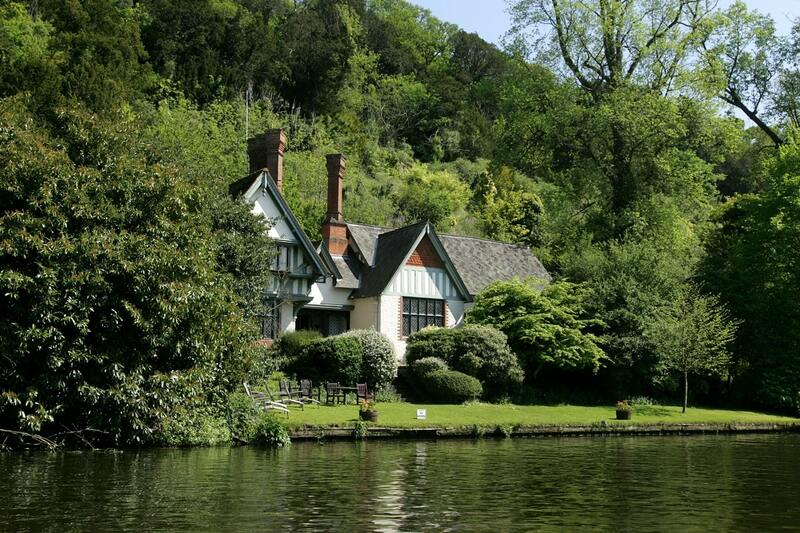 What it offers: Remote setting in the National Trust grounds of the magnificent Cliveden House on the banks of the River Thames. Built in 1813 as the Countess of Orkney’s summerhouse in 1813, with a rich history all to itself. Serving many purposes over the years it was used as a banqueting house; fishing villa; a retreat for the then owner of Cliveden; the Duke and Duchess of Sutherland to entertain Queen Victoria; and during the Astor years of ownership it was leased out to London Osteopath Stephen Ward as a weekend retreat which inevitable brought about the Profumo Affair. It is a three bedroom cottage that can sleep 6 in 2 double bedrooms (1 en-suite) and a children’s room (with 2 single beds), large bathroom complete with walk-in shower, bath and splash TV, two lounges with open fireplaces, a small office area, country kitchen with AGA and dining area, rear garden with the original ‘Spring’ and small lake and a private River Thames boat launch mooring. What the hotel offers: Luxury Spa and fitness facility with indoor pool and outdoor pool, fine dining restaurant in the main house and brasserie in the former stable block, tranquil water garden, fitness trail, indoor and outdoor tennis courts, vintage flotilla, children’s play area, National Trust gardens, woodlands and maze. Costs: from £2,055 per night. Luxury Restaurant Club offers available with dining, download free app here. What it offers: Part of the legendary Greywalls Hotel, the Colonel’s House was built just beyond the Greywalls Gates, in the late 1960’s. Light and spacious it accommodates up to 8 people. It has a charming drawing room with French windows opening onto a private garden and terrace, a full kitchen, small cosy study where the housekeeper can set out a drinks tray, four good-sized bedrooms, each with its own bathroom – two of the bedrooms are en-suite and two have their bathroom located just outside the bedroom. There are two further single rooms annexed off one of the double rooms, and these require shared bathroom facilities. The house provides comfortable and relaxing accommodation just a short 500 yards from Greywalls, where you can enjoy the hotel amenities and relax for breakfast each morning. Ideal for golfing groups or a family party. What the hotel offers: Designed by Sir Edwin Lutyens, Chez Roux dining, lounges, and a golfer’s paradise – there are ten golf courses, including four championship courses, within 5 miles of Greywalls. The region’s microclimate ensures more playable days than elsewhere in Scotland. Most of East Lothian’s golf courses are traditional Scottish links style with undulating fairways, hidden bunkers, gorse and heather lining the fairways. Costs: £1,500 per night April till October and £1,200 November till March. Luxury Restaurant Club offers available with dining, download free app here. What it offers: This elegant Georgian house is set in two acres of immaculately kept, private garden within the grounds of Hartwell House. It has 4 en-suite bedrooms, sleeping seven people. The master suite has a four-poster bed with separate sitting room. The ground floor offers a spacious Drawing Room with French doors leading to the garden, large fully-equipped kitchen, guest cloakroom, dining room (seats 10), a boardroom (seats 10). Offering views to St Marys Church and Hartwell grounds and private gated access and an outdoor swimming pool (during summer months). What the hotel offers: One of England’s stately homes set in over 90 acres of gardens and parkland designed by a contemporary of Capability Brown, located within the Vale of Aylesbury and on the edge of the Chilterns, an area of Outstanding Natural Beauty. It is a National Trust-owned Grade 1 listed Jacobean and Georgian house providing all that is best in country house hospitality and service with a spa. Costs: From £2,200 per night. The property has a minimum stay of 5 nights. Luxury Restaurant Club offers available with dining, download free app here. What it offers: The Pavilion is a self-contained thatched cottage in the grounds of Gidleigh Park overlooking the croquet lawn. It can accommodate 4 guests and comprises of a two bedroom interconnecting suite, each bedroom with its own bathroom, an open plan panelled sitting room with kitchen/diner and a private veranda. Also has a stocked pantry with tea, coffee and homemade biscuits. It is dog friendly. What the hotel offers: Gidleigh Park is a moorland manor house in 107 acres of beautiful gardens with unique water garden, bluebell woods and bespoke kitchen garden. It is a walkers paradise too as it sits on the foothills of Dartmoor. Back at Gidleigh, the main house offers Michelin-starred dining with renowned wine cellar with over 1,300 bins and 13,000 bottles. Also has a tennis court, fly-fishing (fishing license must be obtained), 18 hole putting course, croquet lawn and in-room beauty treatments. Costs: From £710.00 bed and breakfast, based on two people sharing. Luxury Restaurant Club offers available with dining, download free app here. What it offers: The Cary Arms has four cottages, all 3 or 4 bedrooms within 5 minutes walk to the hotel, all sea-facing with their own outdoor terraces, gardens and BBQ’s. Also an additional cottage next door to the hotel. Here we focus on our favourite, Bay Cottage, built in the 1800’s, which exudes plenty of coastal charm with a fusion of countryside character and Mediterranean feel. The sea views are breathtakingly beautiful from inside and out. The cottage sleeps up to four guests with a luxury King Double and King Twin/zip, both with contemporary en-suite bathroom. Also has a cosy sitting room with a wood burner, characterful country style fully-fitted kitchen with dining area, relaxing snug area, separate shower room, large private terrace with panoramic sea views and garden, car park. Not suitable for children under 12 years old or for pets. What the hotel offers: Known as “The Inn on the Beach”, the Cary Arms is one of the finest boutique hotels in Devon, brimming with coastal charm and combining all the values of a classic English Inn with the style and comfort of the best luxury hotels in Devon. The outstanding setting and views are breathtakingly beautiful all year round. A great restaurant with the freshest of seasonal produce and a glass faceted sea-facing spa includes a waterfall hydrotherapy pool, relaxation area, steam room, sauna, exotic experience shower, gym, three treatment rooms – one being a couples treatment room – and changing facilities. Owned by world famous hoteliers Peter and Lana de Savary. Costs: From £425 per night (two night minimum requirement). Luxury Restaurant Club offers available with dining, download free app here. What it offers: On a sunny day, open the bi-fold doors from the open plan living space and make the most of the south facing private garden, which is perfect for entertaining. This three bedroom cottage offers five star standard accommodation with modern and fresh interiors. Bedrooms can be configured as double or twin to suit your needs and there is parking for up to 3 cars. What to hotel offers: Rudding Park is a stunning Grade I Regency style stunning Mansion House in 2,000 acres just outside of Harrogate. Has two excellent restaurants, 18-hole golf course,flood-lit driving range, spa and gym, cinema suite and small library. Costs: From £192 per night with a minimum 3 nights stay requirement. Luxury Restaurant Club offers available with dining, download free app here. What it offers: This luxurious, deceptively large property sleeps up to eight in four bedrooms (two of which can be made as twins) with three bathrooms. There is a large entertaining & living space with wood-burning stove & underfloor heating for the winter months, a beautifully appointed kitchen open to both the living & dining areas, secluded courtyard for al fresco dining when the weather is warm. You can dine in the Tithe Barn, The Swan of the Ox Barn, or have your meals delivered to the cottage. of restored 17th century farm buildings, houses and cottages. Collectively, they form a peaceful hamlet environment and evoke a ‘village within a village’ spirit that epitomises the natural beauty of the surrounding area. It has a 31 bedroom Georgian rectory hotel, The BAA (bar), Ox Barn (a 56 seater destination restaurant), Meadow Spa with pure water swimming pool and hot spring tub, yoga and pilates, tennis, working farm, a range of country pursuits and local walk and cycle routes.